nesdev.com • View topic - Nes ASM question: Wait/Delay? Post subject: Nes ASM question: Wait/Delay? Hello! I'll like some clarifications about some code I wrote right now. I followed the tutorial of the site https://book.famicom.party/chapters/05-6502assembly.html , and I copy pasted the program that simply changed the background and figured I'll get my hands dirty and decided to write a loop that will go over a bunch of different colors. 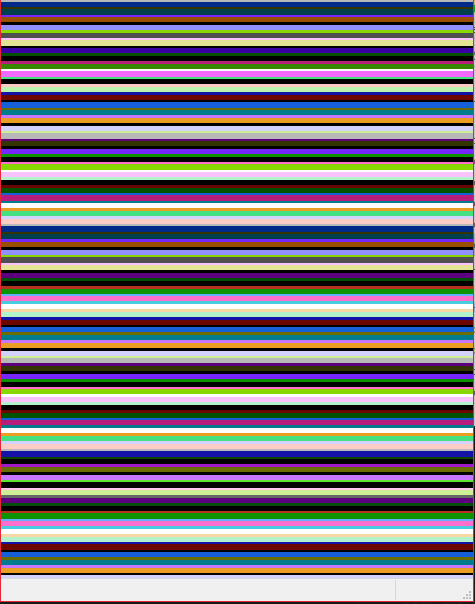 I figured this is because the color is changing too fast, so I add the two nested loops to add a bunch of NOPS just to see if that was the reason and sure enough, now I get a nice, solid background that last for a few seconds. So my question is: This feel incredibly hacky, how does one exactly wait a certain ammount of time for events to happen? I guess Ideally you'll be able to wait for certain ammount of frames to have passed? This is my first time programming for a console and coding with ASM, so I'm a little bit lost here. Post subject: Re: Nes ASM question: Wait/Delay? 1- The CPU itself runs at a certain speed. Each instruction takes a certain amount of time. However, this method is a total pain to do anything with, so few people have bothered unless they need it in addition to one of the following. 2- The PPU can provide a signal every vertical redraw. Almost everything ever written for the NES uses this. In NTSC territory, this signal happens at 60Hz; in PAL it happens at 50Hz. 3- The CPU's sound engine provides another signal that's almost the same as #2, but slightly different. I don't think anything really used it. 4- The CPU's sound engine can provide a signal every time its audio hardware needs more data for its sample playback mechanism. Although there(Bee 52) are things that used this for non-audio purposes, most of the time this is just used for sample playback. If that's literally all your code is doing, then yes, the behaviour you get is (more or less) correct. You're just spewing data at the PPU constantly, with no concept of when it's proper to do so. You need to learn what VBlank/NMI is, which should answer all your questions (and ensure you can do something at a set rate of time, i.e. 60 times a second for NTSC, or 50 times a second for PAL). It's partially (but not entirely) covered in the next chapter of what you're reading. Otherwise, refer to the wiki, else ask questions w/ code here. Basically you shouldn't be writing to the PPU in the main loop. The CPU and PPU run in parallel, so if you have the CPU change colors whenever, without any regard for what the PPU is doing, you're gonna get corrupted results during the entire frame. You may get away with writing to the PPU in the main loop during initialization when the screen is off, but other than that, you shouldn't do it. The absolute reference of time on the NES is the vertical blank (vblank), which's the little bit of time that comes after the PPU is done drawing a frame and lasts until it starts drawing the next frame. It's during this time that you can make changes to the screen, because the PPU itself isn't using the video memory then. To help programmers know when vblank starts, the engineers of the NES made it so that an NMI fires when vblank starts, causing the CPU to stop whatever it's doing and jump to the NMI handler... And it's via the NMI handler that you keep track of time, because we know that vblanks happen at the rate of the video signal (60fps on NTSC, 50fps on PAL). This just increments a variable once every vblank, so the main loop can simply wait for this variable to change before processing another frame, and since this variable only changes 60 times per second, the main loop will also run 60 times per second, and your game logic is now synced to the video.